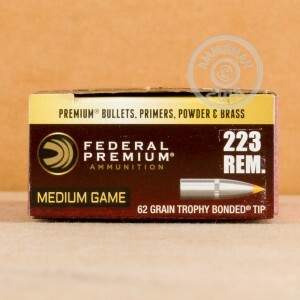 This ammo features the polymer-tipped Trophy Bonded Tip bullet and performs well against varmints and (where legal) deer. 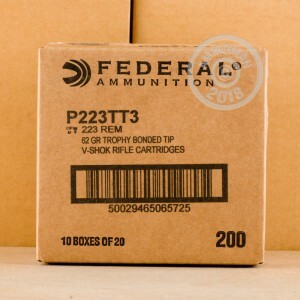 Each cartridge in this box of 20 fires a 62 grain Trophy Bonded Tip at a muzzle velocity of 3,050 feet per second and delivers similar ballistics to M855 ball ammo--a plus if you like to go from the range to the field without adjusting your optics. The Trophy Bonded Tip bullet delivers excellent external and terminal ballistics thanks to its polymer tip and solid copper shank. Upon contact with the target, these rounds produce deadly expansion for a quick, clean kill and easy retrieval. 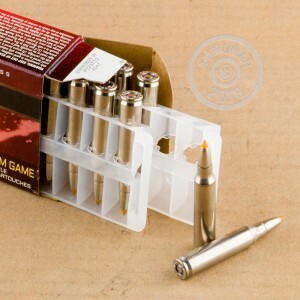 These cartridges use non-corrosive Boxer primers and reloadable brass cases. Like other products at AmmoMan.com, they qualify for free shipping if your order total exceeds $99.